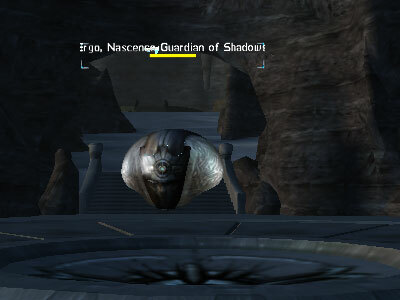 The first ring you can get your hands on in the Shadowlands is one via a quest from Ergo in Nascense. The same ring can be gained from a Rubi-Ka quest. However the quest is different. To start the quest, you need to find Ergo. 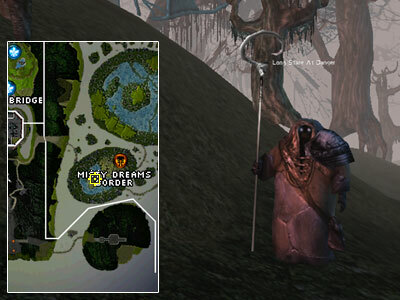 We happened to bump into a friendly yuttos called The One Who Walks In Circles by the Misty Dreams Border and he gave us some directions. The One Who Walks In Circles told you that in order to find Ergo, you had to head west over the path before him. Once over the path, you will need to find a way under the mountains. 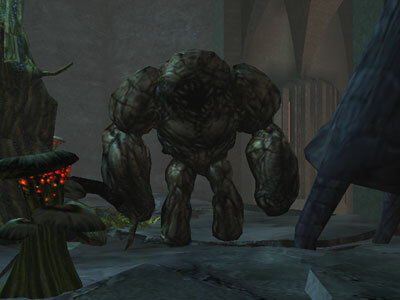 A tunnel will lead you out into a rocky plain, where you will see the scientists' city of Jobe to your right. Follow the rocky path south to the far reaches of plain and then look to the east. 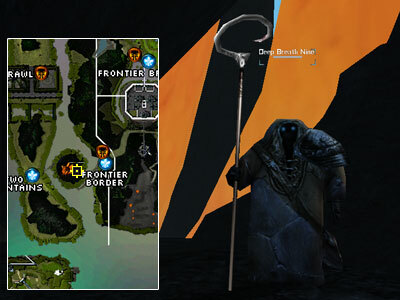 You should then see the entrance to the path that leads to Ergo's island there. Location: 1428 x 196, furthest SE island in Nascense. After an incredibly long journey, you will arrive at Ergo. Ergo, not one to be short of a few words to say, will give you some interesting information. He will then advise you to seek out Long Stare at Danger (Swamps, north of ergo) and Deep Breath Nine (Wilds). Ergo will have given you a Fumigating Canister to take to the Yuttos. You can choose which Yuttos to go to visit, both will send you on a mission to gain the part you need. We chose to go to Deep Breath Nine as he was the closest to Ergo. So, Master of Light.. what are you waiting for? Ukblizzard: I come from Ergo, I have a little something he asked me to give you. Deep Breath Nine: Oh! Sorry, please show me what it is, but do it quietly! Trade the canister from Ergo to the yuttos. The yuttos will open it and advise you to go under the hive. In there you will find an entrance, leading you to the molokh. They apparently have what Ergo needs. To get to the mission entrance, run past the yuttos and into the orange cancerous cluster of cocoons reaching far into the sky. You need to locate the Embryonic Molokhai. When you kill it, a Larval Molokhai spawns. When you kill that, a Metamorphosing Molokhai spawns. When you have killed that, a Young Molokhai spawns. The Young Molokhai is the final Molokhai. On its corpse you can loot a Baby Molok Oil. All of these mobs range from level 30 to 45ish. You will need to go through almost the same process as stated for the other yutto. Talk with Ergo and tell him that you think you have found the oil that he was looking for. He will then give you "Mark of the Menace" which he then asks that When you feel you are ready, show me this Mark and I will arrange for your trial of passage. Open dialog with Ergo and show him the Mark of the Menace. Once you do this, he will enter the vault behind him. 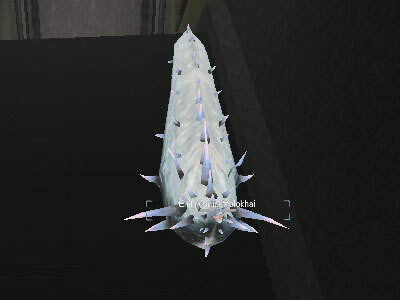 A mission key will pop into your inventory and your next task is to find the Nascence Menace, strike it down and bring from it a Pellucid Crystal together with the Mark of the Menace. Loot the Pellucid Crystal from his corpse and then return to Ergo. Tell Ergo that you have the Pellucid Crystal and the Mark of the Menace! He will reward you with this Insipid Ring. 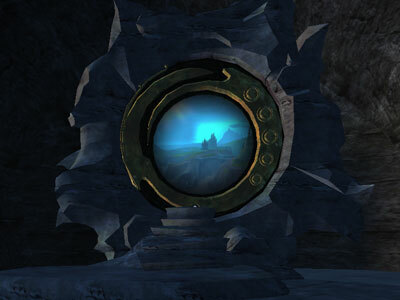 just let the ring touch the portal behind Ergo.. and you can travel to Elysium!